Rising South Korean boyband FTIsland (FTI) performs at the Plenary Hall of the Philippine International Convention Centre (PICC) on March 6. SpinManila, Inc., and events and concerts company brings the first all-out live KPop music experience to the Philippine stage. 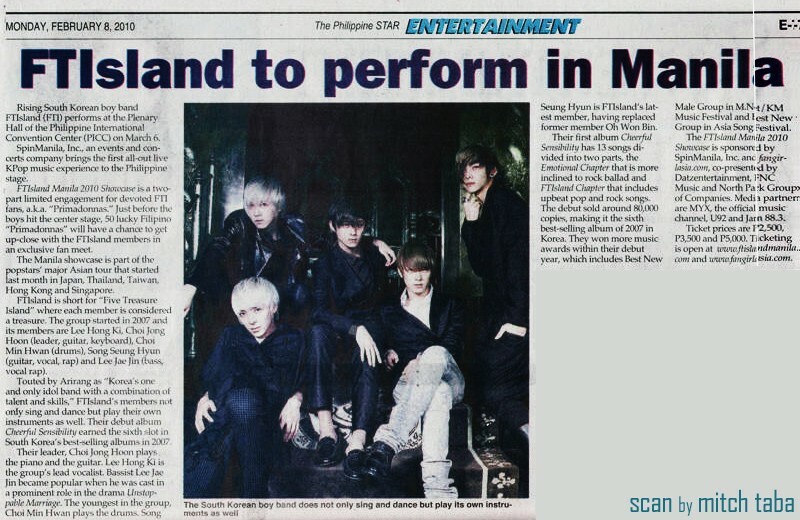 FTIsland Manila 2010 Showcase is a two-part limited engagement for devoted FTI fans, a.k.a. “Primadonnas.” Just before the boys hit the centre stage, 50 lucky Filipino “Primadonnas” will have a chance to get up-close with the FTIsland members in an exclusive fan meet. The Manila showcase is part of the popstars’ major Asian tour that started last month in Japan, Thailand, Taiwan, Hong Kong and Singapore. FTIsland is short for “Five Treasure Island” where each member is considered a treasure. The group started in 2007 and its members are Lee Hong Ki, Choi Jong Hoon (leader, guitar, keyboard), Choi Min Hwan (drums), Song Seung Hyun (guitar, vocal, rap) and Lee Jae Jin (bass, vocal rap). Touted by Arirang as “Korea’s one and only idol band with a combination of talent and skills, “FTIsland’s members not only sing and dance but play their own instruments as well. Their debut album Cheerful Sensibility earned the sixth slot in South Korea’s best-selling albums in 2007. Their leader, Choi Jong Hoon plays the piano and the guitar. Lee Hong Ki is the group’s lead vocalist. Bassist Lee Jae Jin became popular when he was cast in a prominent role in the drama Unstoppable Marriage. The youngest in the group, Choi Min Hwan plays the drums. Song Seung Hyun is FTIsland’s latest member, having replaced former member Oh Won Bin. Their first album Cheerful Sensibility has 13 songs divided into two parts, the Emotional Chapter that is more inclined to rock ballad and FTIsland Chapter that includes upbeat pop and rock songs. 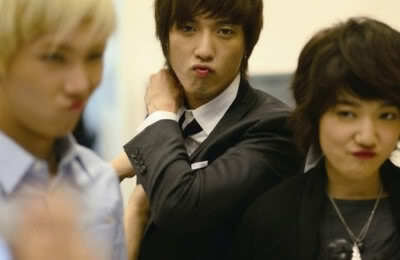 The debut sold around 80,000 copies, making it the sixth best-selling album of 2007 in Korea. They won more music awards within their debut year, which includes Best New Male Group in MNet/KM Music Festival and Best New Group in Asia Song Festival. The FTIsland Manila 2010 Showcase is sponsored by SpinManila, Inc. and fangirlasia.com, co-presented by Datzentertainment, FNC Music and North Park Groups of Companies. Media partners are MYX, the official music channel, U92 and Jam 88.3.